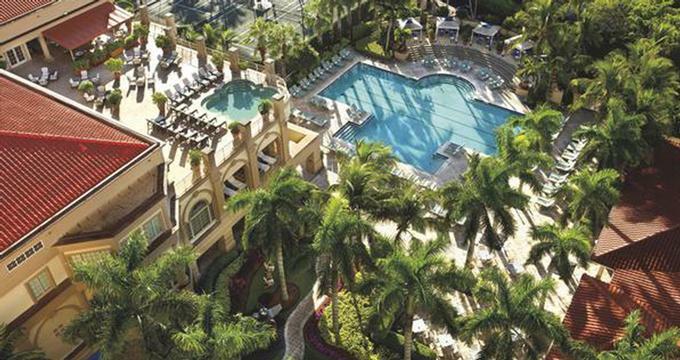 The Ritz-Carlton, Naples in Florida is a romantic weekend destination where you can expect to be pampered 24 hours a day. The Old World-style resort is set on three miles of white sandy beach and is surrounded with landscaped gardens, stone fountains and courtyards. The hotel lobby is furnished with a collection of art, antiques and European furniture. The concierge staff can provide art tours of the lobby upon request. The resort offers a range of recreational activities. There are two heated swimming pools, a fitness center, four lighted tennis courts and a 51,000 square foot spa complex. The spa has 30 treatment rooms, sauna and steam rooms, mineral pool, beauty salon and a sundeck. One can choose from a number of signature treatments such as the Anastasia Eyebrow Technique. H2O+ Cafe serves tasty yet healthy spa-inspired meals and makes it easy for couples to have a health-conscious romantic weekend getaway. Resort guests enjoy preferred golfing privileges at Triburon, a 27-hole championship golf course designed by Greg Norman which is located three miles from the hotel. For families, there is a heated outdoor family pool with sundeck and supervised children's programs for ages 5-12. The Nature's Wonder center lets children learn about marine life hands-on. The resort has 463 guest rooms, including 22 suites and 70 Ritz-Carlton Club rooms and suites. Most of the rooms have private balconies and views of the the beach and Gulf of Mexico. The Club level is located on the 12 and 14 floors of the resort and features a library with over 700 books. Choose from several restaurants, each with a unique and diverse menu. Artisans is a AAA Five Diamond restaurant which specializes in fresh seafood. The Grill is a traditional stake house serving rare wine. There is also the Poolside Cafe, and the Lobby Lounge with afternoon tea service and piano entertainment. In addition to the spa and recreational activities, you can visit downtown Naples, 30 minutes by car, which features restaurants and boutique shopping. Browse more Florida ideas and save with a package. Doubles from $399 per night. The resort, which overlooks the Gulf of Mexico, is a 45-minute drive from Southwest Florida International Airport and two hours from Miami International Airport. The hotel concierge can arrange transportation to and from the airport.